I am now the proud owner of 2 gold colored coinfusion coins. So what's the story behind them? How many of each was made? Etc.? Wow, must be your lucky day. I saw these at the Midwest Geobash and they are beautiful. I am as coinfused as the rest of them. This was a project that originally was going to be a "coins in caches" only project, inspired by the Santa Mystery coin. All of the cachers mentioned on the coin were involved in the project, including random distribution, trades, gifts, etc. I think there were about 7 different metals minted, but I don't know the exact minting of each one. Indy Diver's are the only ones that say "Indy Diver" on the coin edge (in addition to the other edge text). These were meant to be a fun coin to find in caches, and their minting isn't really limited (although it does say 2006 on the coin, so probably no more will be minted beyond the end of the year). They were never meant to be sold. There is some information about the coin on cointracking.com but not sure it tells the number made. I'm guessing they are the unplated brass, which look very much like gold. Well much like the Santa coin , anyone wanting to send me a coinfusion coin anonymously please feel free to do so . Current metals I have located are Copper and Black Nickel . 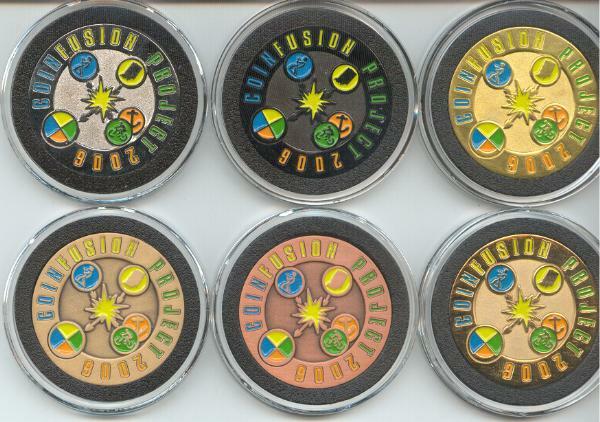 Here is my full set of Coinfusion Project coins I recieved from M10B. The scan on the upper left, Side one looks very dark but is actually the silver coin. On the edge of each coin it states "Property of the Coinfusion Project Not to be Sold". L to R Top Row-Silver, Black Nickel, Antique Gold. Bottom Row-Antique Copper, Copper, Gold. Please understand these are what I am calling them. I noted in CoinTracking.com there were variations to the naming, hence the confusion about 7 or 8 different metals. There were other metals minted that Indy Diver didn't order, so those don't have coin editions. Top left is shiney nickel. The top right is unplated bronze. The bottom, left is Antique Gold. Bottom right is foggy gold. No gold were minted, except 1 sample. There is also 1 sample of antique bronze. 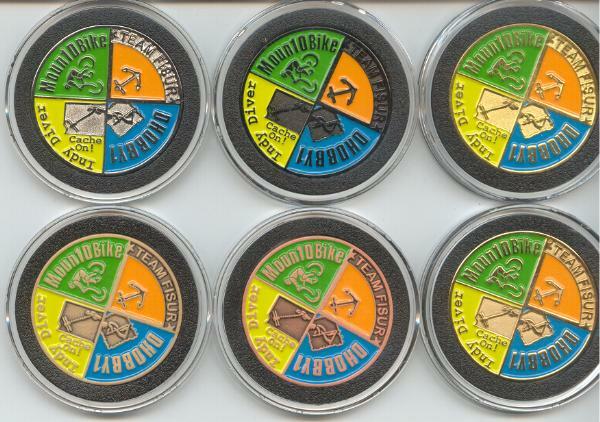 If you count the "Indy Diver" edge text coins as a different version (they were minted seperately, so I guess you could), I think there are a total of 13 versions. Here are the minting numbers to the best of my knowledge. Found mine in a cache a couple months back. Inquired to Team Fisur and got strange " We don't discuss CoinFusion" reply. So, I emailed Moun10bike. He explained it was a joint project by the original geocoin creators to put out a coin. Simple enough I guess. The first rule of the Coinfusion Project is no one talks about the Coinfusion Project. The second rule of the Coinfusion Project is no one talks about the Coinfusion Project. This thread must be closed!!!!!!!!!!!!!!!!!!!!!!!!!!!!!!!!!!!!!!!!!!!!!!!!!!!!!!!!!!!!!!!!!!!!!!!!!!!!!!!!! I wonder if it is too hot and humid down here in the south for the coinfusion project! I would LOVE to find one of these coins in a cache or to make it easy in my...........mailbox! LOL! Well, I wonder if part of the Coinfusion is to not ever be straight about what metals were minted. Mine is certainly Shiny, and certainly Gold, and certainly Plated(I know because much of it is peeling off, making mine ONE OF A KIND!!). I don't have a clue where I found it, but it was way before I started collecting Coins. I was picking through my collection of Sigitems, and pulled this one out to place in my new Coin collection. I probably found it over a year ago. Thank You to the creators of this great Coin! !